Orange pepper is 'Alma', skinny red one is 'Magyar', and fat red one is 'Leutschauer'. Got these seeds from Renee's, Baker Creek, and Seed Savers. I am growing three kinds of paprika peppers this year, in the hopes of making my own spice powder for the year. So far this has been a tremendous success. 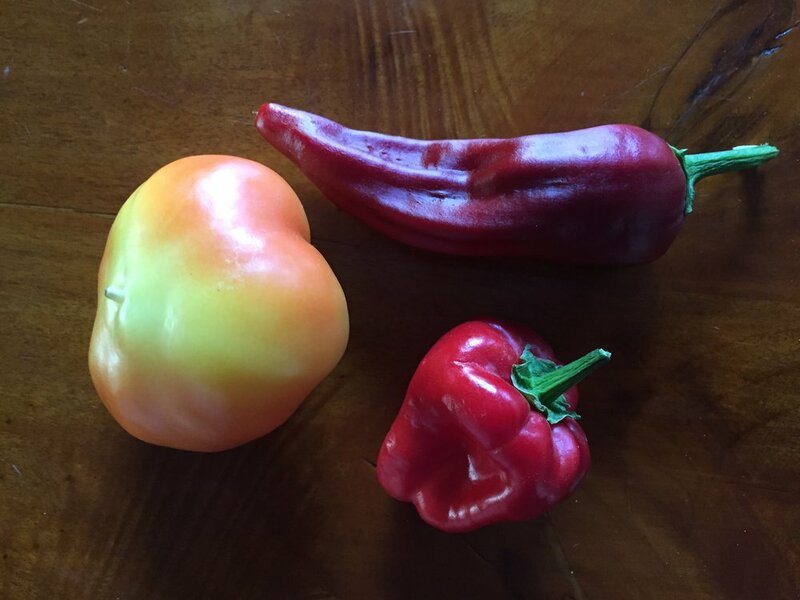 All three of these peppers are producing like crazy. 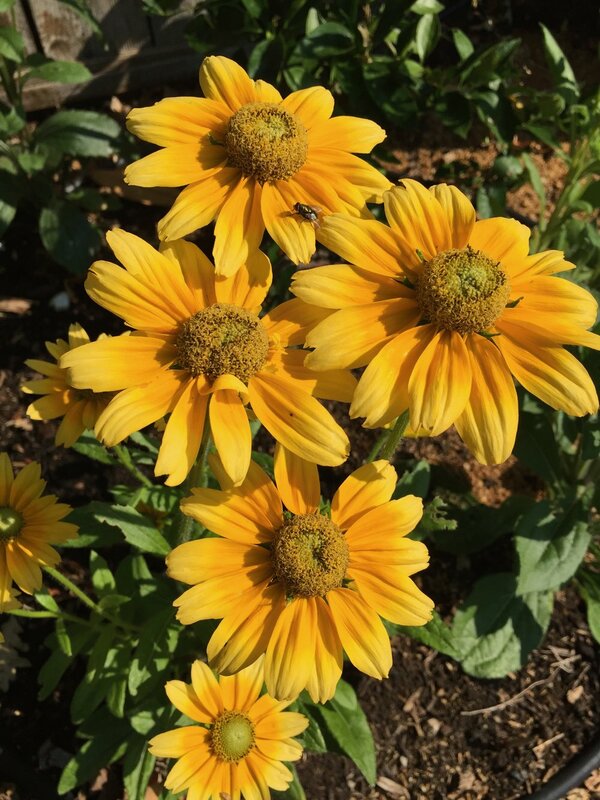 When fresh, they are all mild enough to eat on sandwiches or salads (at least mild enough for my pepper-loving son, I haven't tried them that way) and when ripe, have been excellent for making paprika. 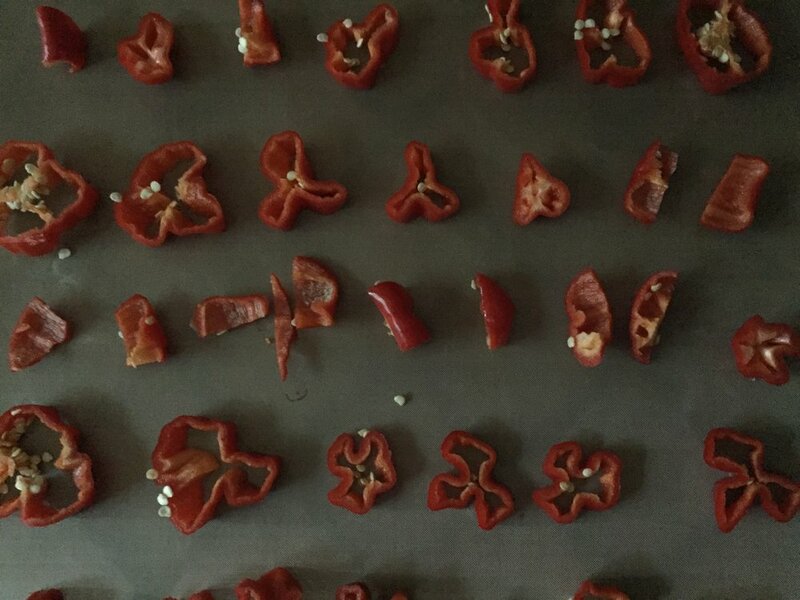 For regular paprika, I just slice up the peppers and dry in them in the dehydrator, then grind them in our spice mill (a dedicated Krups coffee grinder). For smoked paprika, we smoke them for about six hours over hickory wood smoke, then slice and dry in the dehydrator. This has yielded a particularly yummy result. It's lovely and fresh in jars, and will make nice additions to our meals over the next year. It can also be used in other homemade spice mixes such as chili powder, which is next on my list. I also want to smoke some jalepenos to make dried chipotle peppers. In other news, I've read a couple of articles that I thought you might be interested in, regarding the current fires in California and climate change. The first is from one of our favorite local farms, Full Belly. This article starts off reporting the condition of the farm after a fire passed within its boundaries, but then goes on to explain all about soil health and water conditions. You can read this article HERE. The second is from the LA Times, and it explains how the current fire conditions (and weather conditions, and water conditions, it's all related) are a direct result of climate change. Here in California, there's been a distinct shift (in the last year) from speculation to confirmation, regarding climate change. (And as you know, our current administration is still denying it.) You can read that article HERE. I still haven't gotten around to making the August wreath yet. It's been too hot and smoky to get out on a hike and see what's available. I'll post it when I get to it, but meanwhile last month's wreath has dried beautifully and still looks nice, so there's no rush. Now, off to make tomato/basil sauce for the freezer!